The aging former Belfast Maskers’ building on the Belfast waterfront is slated for demolition later this month. 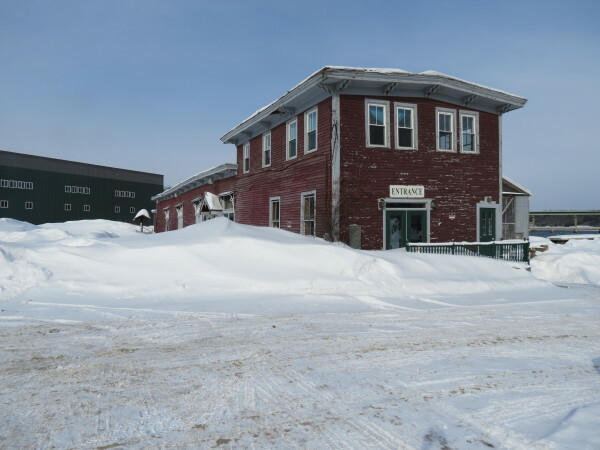 BELFAST, Maine — After the right person did not step forward with a plan to pick up and haul away the former Belfast Maskers’ building on the Belfast waterfront, the fate of the 19th century structure has been sealed. The red wooden building, which was built in about 1870 as a railroad freight house, will be taken down this fall. Demolition will start no sooner than Monday, Oct. 19, and must be substantially completed by the end of the month, according to Belfast Economic Development Director Thomas Kittredge. In February, city officials said they’d give the building away for free to anyone who would agree to relocate it, but the search was unsuccessful. That meant that the city had to move forward with the demolition effort. The building, and a small, concrete-block storage building adjacent to it, need to be removed in part because Belfast has identified contaminants in the soil around them and must clean up the 2.79 acre city-owned site. The city has received a $200,000 grant through the Environmental Protection Agency to do so, Kittredge said, adding that the agency required a 20 percent or $40,000 match from Belfast. The building was constructed when the Belfast & Moosehead Lake Railroad developed a parcel of flat land built with fill next to the Passagassawakeag River. Along with the freight house, the railway built a locomotive house, railway turntable, loading docks and a passenger station. All that remains on the property is the railroad freight house. Most of the other buildings were demolished by 1985. The freight house was used by the Belfast Maskers community theater group until 2011, when the city insurance policy stopped covering the building. It has been vacant ever since. Architectural components will be rescued and given to three nonprofit organizations that asked for mementos, including the Brooks Preservation Society, the Belfast Historical Society and Our Town Belfast. Kittredge said the city also had to have a full historical record of the building made as a requirement of the grant. That record has been completed and accepted by Maine Historic Preservation, meaning that the demolition can proceed. “Everyone’s been very eager to get it underway, but we had to go through the appropriate process,” he said. After the site is cleared, city officials will work on figuring out what’s next for the property. “I think when the buildings are gone, people can visualize what could take place,” Kittredge said.